According to Lewis Concept an Acid-Base reaction involves an interaction of a vacant orbital of an acid (A) and a filled or unshared orbital of a base (B). The species A is called Lewis Acid or a generalized acid and B is called Lewis Base or a generalized base. A strong acid A and a strong base B, will form the stable complex A : B. A concept known as Principle of Soft and Hard Acids and Bases(SHAB) Principle is very helpful in making a stability of the complex A : B. According to this principle the complex A : B is most stable when A and B are either both soft or both hard. The complex is least stable when one of the reactants (namely A and B) is very hard and the other one is very soft. In order to arrive at a comparative estimate of the donor properties of different bases, the preferences of a particular base to bind a proton H⁺ and methyl mercury (II) ion, [CH₃HgB]⁺ was determined. The results indicate that bases in which the donor atom is N, O or F prefer to coordinate to the proton. Bases in which the donor atoms is P, S, I, Br, Cl or C prefer to coordinate to mercury. The donor atoms in the first group have high Electronegativity, low Polaris ability and hard to oxidize. Such donors have been named ‘hard’ bases by Pearson, since they hold on to their electrons strongly. The donor atoms of second category are of low electronegativity, high polarisability, and are easy to oxidize. Such donors have been called ‘soft’ bases since they are hold on to their valence electrons rather loosely. In simple terms hardness is associated with a tightly held electron shell with little tendency to polarise. On the other hand softness is associated with a loosely bound polarisable electron shell. Thus F - is the hardest and I - is the Softest base. After having gone through a classification of bases, a classification of Lewis acids is necessary. The preferences of a given Lewis acid towards ligands of different donor atoms is usually determined from the stability constant values of the respective complexes or from some other useful equilibrium constant measurements. When this is done, metal complexes with different donor atoms can be classified into two sets based on the sequences of their stabilities. Hard acids have small acceptor atoms, are of high positive charge and do not contain unshared pair of electrons in their valence shell, although all these properties may not appear in one and the same acid. These properties lead to high electronegativity and low polarisability. In keeping with the naming of the bases, such acids are termed as 'Hard'Acids. Soft acids have large acceptor atoms, are of low positive charge and contain ushered pairs of electrons in their valence shell. These properties lead to high polarisability and low electronegativity. Again in keeping with the naming of the bases, such acids are termed 'Soft' Acids. A Hard Acid will prefer to combine with a Hard Base and a Soft Acid will prefer to combine with Soft Base and thus a more stable product will be obtained. Hard Acid - Hard Base may interact by strong ionic forces. Hard Acids have small acceptor atoms and positive charge while the Hard Bases have small donor atoms but often with negative charge. Hence a strong ionic interaction will lead to Hard Acid - Base combination. On other hand a Soft Acid - Soft Base combination mainly a covalent interaction. Soft Acids have large acceptor atoms, are of low positive charge and contain ushered pair of electrons in their valence shell. [CoF₆]⁻³is more stable than [CoI₆]⁻³. F⁻ is a hard base and I⁻ is a soft base. Hence [CoF₆]⁻³ (Hard Acid + Hard Base) is more stable than [CoI₆]⁻³ (Hard Acid + Soft Base). The existence of certain metal ores can also be rationalised by applying SHAB principle. Thus hard acids such as Mg+2, Ca+2 and Al+3 occur in nature as MgCO3, CaCO3 and Al2O3 and not as sulphides (MgS, CaS and Al2S3), since the anion CO3-2 and O-2 are hard bases and S-2 is a soft base. Soft acids such as Cu+, Ag+ and Hg+2 on the other hand occurs in nature as sulphides. The borderline acids such as Ni+2, Cu+2 and Pb+2 occur in nature both as carbonates and sulphides. The combination of hard acids and hard bases occurs mainly through ionic bonding as in Mg(OH)2 and that of soft acids and soft bases occurs mainly by covalent bonding as in HgI2. 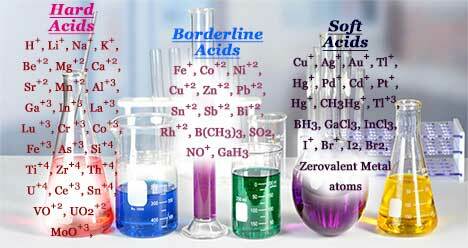 Classify the following as Hard and Soft Acids and Bases. The hydride ion has a negative charge and is far too large in size compared to the hydrogen atom. Its electronegativity is quite low and it will be highly polarisable by virtue of its large size. Hence it is Soft Base. Quadrivalent nickel has quite a high positive charge. Compared to bivalent nickel its size will be much smaller. Its electronegativity will be very high and polarisability will be low. Hence it is Hard Acid. Mono-positive iodine has a low positive charge and has a large size. It has a low electronegativity and a high polarisability. Hence it is a Soft Acids. H+ has the smallest size with a high positive charge density. It has no unshared pair of electrons in its valence shell. All these will give a high electronegativity and very low polarisability. Hence H+ is a Hard Acid. AgI2- is stable, but AgF2- does not exist. Explain. We know that Ag⁺ is a soft acid, F⁻ is hard base and I⁻ is soft base. Hence AgI₂⁻ (Soft Acid + Soft Base) is a stable complex and AgF₂⁻ (Soft Acid + Hard Base) does not exist. Explains why Hg(OH)₂ dissolved readily in acidic aqueous solution but HgS does not? In the case of Hg(OH)₂ and HgS, Hg is a soft acid and OH⁻ and S⁻² is hard base and soft base respectively. Evidently HgS (Soft acid + Soft base) will be more stable than Hg(OH)₂ (Soft Acid + Hard base). More stability of HgS than that of Hg(OH)₂ explain why Hg(OH)₂ dissolved readily in Acidic Aqueous Solution but HgS does not.